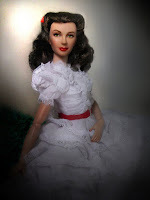 I enjoy doing a photoshoot with the dolls I have in my collection. Here are few more portraits. Why I do them? Well, they're the most cooperative subjects specially if they have articulation. 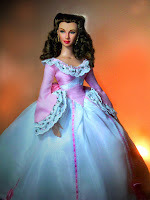 I enjoyed the Tonner GWTW collection if only for the new costumes and the articulation and wish that Franklin Mint's Scarlett would adopt the same format. 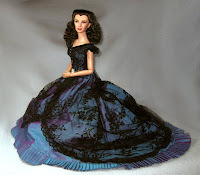 What you see are a mix of Tonner on Franklin Mint Scarletts or vice-versa and one-of-a-kind doll dresses done by Alana Bennett (check out dollfashionsbyalana.com) for more.